Nigora Rasulova, Dauranbek Arybzhanov, Vladimir Lyubshin, Abdulla Abdikhakimov, Shamsutdin Sagdullaev,Sherzod Nishonov, Gayrat Arifhodjaev,Yuliya Shakirova, Valery Krylov, Marat Khodjibekov. Aims: The purpose of this study was to investigate a possible role of serum LDH as a predictor of cancer cell activity and to determine if serum LDH levels can prognosticate the duration of pain-free period after radionuclide therapy. <br> Methods: The We selected 62 breast cancer patients with ages ranging from 29-67 years (mean age 53.2 ± 9.5 years) who had a successful response to radionuclide therapy with 153Sm-oxabifore and had their serum LDH levels determined prior to the therapy. Patients with a history of a benign disease, which could possibly influence the serum LDH levels, or those suffering from complications such as a vertebral fracture or impending cord compression, were excluded from the study. <sup>153</sup>Sm-oxabifore was administrated in a standard dose of 37 MBq per kg body weight. All patients were on bisphosphonate therapy, both before and after samarium-153 treatment. Group 1 comprised of 23 patients who had received combined <sup>153</sup>Sm-oxabifore and zoledronic acid therapy. Group 2 comprised of 39 patients who had additionally received therapy for their primary tumour. For	each of these two groups, the correlation between serum LDH levels and duration of the pain-free syndrome was estimated. <br> Results: There was a strong negative correlation (r = -0.84) between the serum LDH levels and the duration of pain-free period in Group 1, but no significant correlation (r = 0.1) was seen between the LDH levels and the duration of pain-free period in Group 2. The duration of pain-free period in the second group was longer in comparison to the first group and was statistically significant (p < 0.0001). <br> Conclusion: Serum LDH level can prognosticate the duration of the pain-free period after radionuclide therapy and could be useful in selecting patients who in addition to samarium-153 therapy may additionally benefit from treatment of the primary tumour. Nigora Rasulova, Dauranbek Arybzhanov, Vladimir Lyubshin, Abdulla Abdikhakimov, Shamsutdin Sagdullaev,Sherzod Nishonov, Gayrat Arifhodjaev,Yuliya Shakirova, Valery Krylov, Marat Khodjibekov. Lactate dehydrogenase (LDH) as predictive factor of the pain free syndrome duration after radionuclide treatment of bone metastases in patients with breast cancer. Pak J Nucl Med. 2016; 6(1): 11-18. Nigora Rasulova, Dauranbek Arybzhanov, Vladimir Lyubshin, Abdulla Abdikhakimov, Shamsutdin Sagdullaev,Sherzod Nishonov, Gayrat Arifhodjaev,Yuliya Shakirova, Valery Krylov, Marat Khodjibekov. Lactate dehydrogenase (LDH) as predictive factor of the pain free syndrome duration after radionuclide treatment of bone metastases in patients with breast cancer. http://www.pjnmed.com/?mno=284644 [Access: April 22, 2019]. Nigora Rasulova, Dauranbek Arybzhanov, Vladimir Lyubshin, Abdulla Abdikhakimov, Shamsutdin Sagdullaev,Sherzod Nishonov, Gayrat Arifhodjaev,Yuliya Shakirova, Valery Krylov, Marat Khodjibekov. Lactate dehydrogenase (LDH) as predictive factor of the pain free syndrome duration after radionuclide treatment of bone metastases in patients with breast cancer. Pak J Nucl Med. (2016), [cited April 22, 2019]; 6(1): 11-18. Nigora Rasulova, Dauranbek Arybzhanov, Vladimir Lyubshin, Abdulla Abdikhakimov, Shamsutdin Sagdullaev,Sherzod Nishonov, Gayrat Arifhodjaev,Yuliya Shakirova, Valery Krylov, Marat Khodjibekov (2016) Lactate dehydrogenase (LDH) as predictive factor of the pain free syndrome duration after radionuclide treatment of bone metastases in patients with breast cancer. Pak J Nucl Med, 6 (1), 11-18. Nigora Rasulova, Dauranbek Arybzhanov, Vladimir Lyubshin, Abdulla Abdikhakimov, Shamsutdin Sagdullaev,Sherzod Nishonov, Gayrat Arifhodjaev,Yuliya Shakirova, Valery Krylov, Marat Khodjibekov. 2016. Lactate dehydrogenase (LDH) as predictive factor of the pain free syndrome duration after radionuclide treatment of bone metastases in patients with breast cancer. Pakistan Journal of Nuclear Medicine, 6 (1), 11-18. Nigora Rasulova, Dauranbek Arybzhanov, Vladimir Lyubshin, Abdulla Abdikhakimov, Shamsutdin Sagdullaev,Sherzod Nishonov, Gayrat Arifhodjaev,Yuliya Shakirova, Valery Krylov, Marat Khodjibekov. "Lactate dehydrogenase (LDH) as predictive factor of the pain free syndrome duration after radionuclide treatment of bone metastases in patients with breast cancer." Pakistan Journal of Nuclear Medicine 6 (2016), 11-18. Nigora Rasulova, Dauranbek Arybzhanov, Vladimir Lyubshin, Abdulla Abdikhakimov, Shamsutdin Sagdullaev,Sherzod Nishonov, Gayrat Arifhodjaev,Yuliya Shakirova, Valery Krylov, Marat Khodjibekov. "Lactate dehydrogenase (LDH) as predictive factor of the pain free syndrome duration after radionuclide treatment of bone metastases in patients with breast cancer." 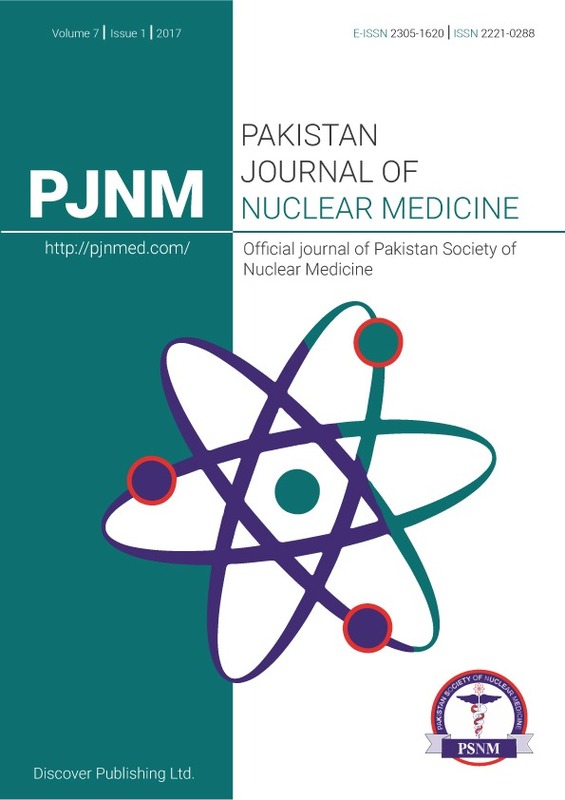 Pakistan Journal of Nuclear Medicine 6.1 (2016), 11-18. Print. Nigora Rasulova, Dauranbek Arybzhanov, Vladimir Lyubshin, Abdulla Abdikhakimov, Shamsutdin Sagdullaev,Sherzod Nishonov, Gayrat Arifhodjaev,Yuliya Shakirova, Valery Krylov, Marat Khodjibekov (2016) Lactate dehydrogenase (LDH) as predictive factor of the pain free syndrome duration after radionuclide treatment of bone metastases in patients with breast cancer. Pakistan Journal of Nuclear Medicine, 6 (1), 11-18.